Expressing my odd opinions and dumping photographs! My start into a freelance business venture began in February and near the end of April I thought it was about time for some relaxing and traveling again. 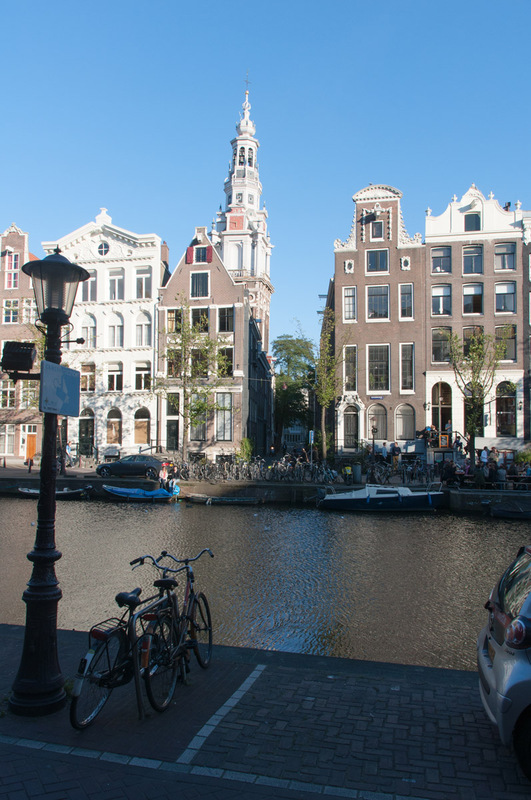 I departed off to Amsterdam for my second attempt at experiencing the city. I had doubts about going to the same place again in such a short time, but I also knew each time you visit a place the impression will be different! I was also very glad that the setting would be different; being in the beautiful harbor city with my girlfriend instead of a group of friends. The last visit also ended with a bitter and extended, complicated illness, so I wanted to go again and have a good end to it. We decided to try out Airbnb for the first time. I had my worries about it working out smoothly, but it all worked out nicely when we arrived on the first day near the evening. We moved into a cozy, two story loft about 10 minutes by foot away from the center. We decided to keep a balance between cooking at home with local groceries from the food markets and eating out at restaurants. On the first evening we ventured into the center of the city to walk around casually, keeping an eye out for starting it all off with a great dinner and wine. We ended up in a steak house sharing a grill platter for two and some red wine to go with it. Laughing and enjoying the first hours away from our daily life back home was priceless. We wobbled back home having had a good time and trying to stay conscious of the bicycle bullets flying by us slow and dumb pedestrians. On the second day we hopped on the city tram buying a 24 hour ticket, knowing we wanted to make a lot of distance and see more of the sights. We started out towards the museum district, then Vondel Park, and back through the city center. The friendly driver gave us our card and we were on the way. We strolled through the museum grounds with an amazing tasting, fresh-squeezed fruit juice from the super market. We checked the ingredients and it was 100% biological and natural. We ended up buying a lot of different varieties of juice during our stay. Neither of us was interested in any of the current exhibitions, so we decided to leave towards the Vondel Park, to lie outside and have some food. 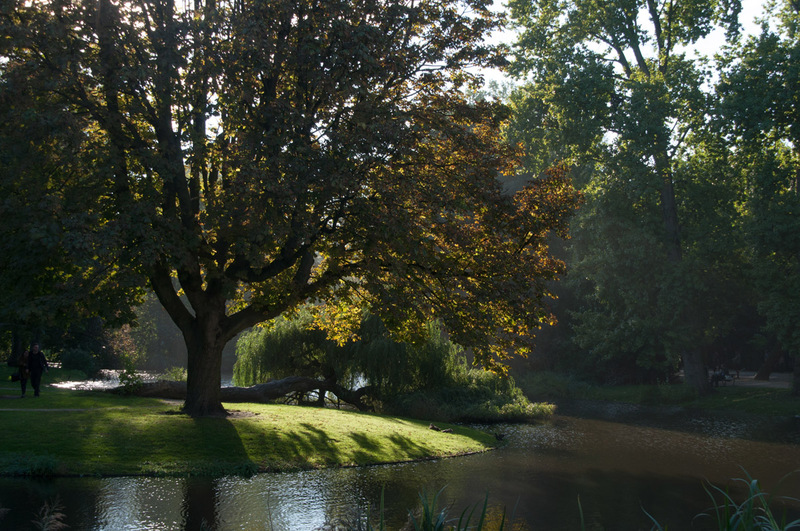 The park is very large (47 hectares / 120 acres) with many people, but also quiet niches where one can relax. I find that the Dutch are very culturally diverse, and they were always friendly to us. We also never had a language barrier problem, everyone seemed to speak English fluently. We walked towards the center and stopped at a Cafe with tables right next to the canal. We had coffee and mozzarella and tomato sandwiches, and chocolate cake with caramel sauce and vanilla ice cream. Hey it’s a holiday after all! The Dutch and Amsterdam lifestyle really “spoke to us” both. I always feel positively uplifted just being in the city. 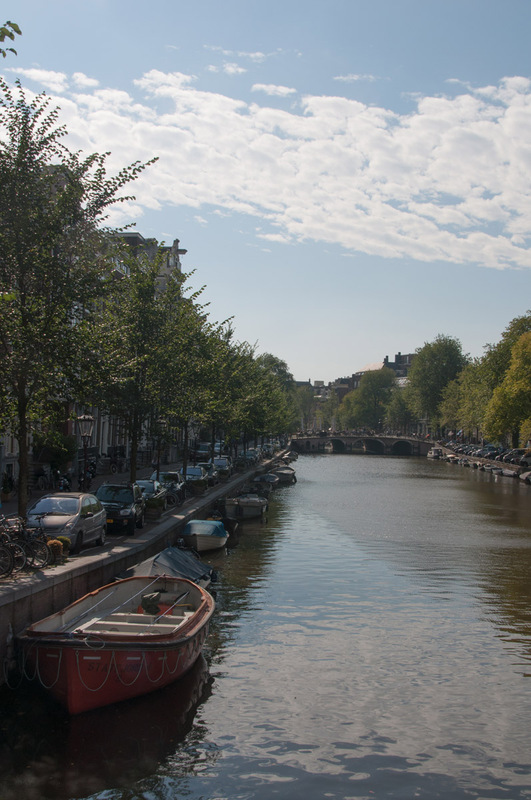 We continued to get “lost” and walked endlessly along the canals until we checked the clock and decided to head to the Albert Cuyp Market in the De Pijp district. They had an amazing variety of fresh produce; the vegetables and fruit all tasted great for acceptable prices. The smell of freshly baked waffles and mini pancakes filled the strolling crowd’s noses. Other ready-to-eat dishes were pickled herring, kebab sandwiches, sausages and potato chips. We thought a giant red snapper fish would be a good choice for dinner, with a seaweed, mango, tomato, zucchini, mushroom curry and rice. The next day, on our way to a fairground in the city, we spotted the Bodies exhibit, which we both heard good things about. They take bodies of deceased people, who donated their flesh for science, and then make a biological exhibition of the parts. We decided to go there the next day, and both found it fascinating and would understand why so many have recommended seeing it. At the fair we got on a Ferris wheel to get some nice aerial shots. Back on the ground, we proceeded through some small shops in the twisting maze of alleys and partook of some street food. 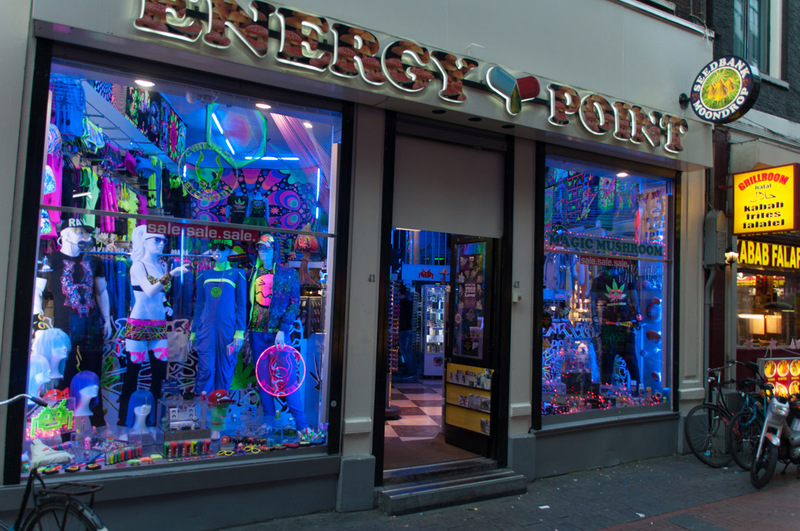 We were in a lot of hip shops, 10 minutes from the central train station, with UV decorated gadgets and clothing. On our last day we decided to visit the zoo. The park and animal enclaves were built with a lot of space and were clean. There was enough to do and see and we didn’t expect to spend almost the whole day there. It was busy, but not overfilled or crowded, and it offered a big variety of animals! The last day we consumed the last of our groceries and stayed up the night to catch our flight back home at 6 in the morning. Sleep deprivation, tight airplane seats and the most obnoxious seat partners behind us rounded off our vacation. Thankfully the flight back wasn’t very long. Winter was approaching quickly day by day and the possibility to take a trip on my motorcycle was becoming less and less possible. I packed my backpack for a short trip to Bratislava and put on my gear padded with warm linings and double gloves. It was almost the end of October, foggy and below 10°C. Since it would only be an hour away I figured it wouldn’t be too bad, but I quickly realized I was pushing the limit with the weather and my limbs felt numb, but I was already committed. 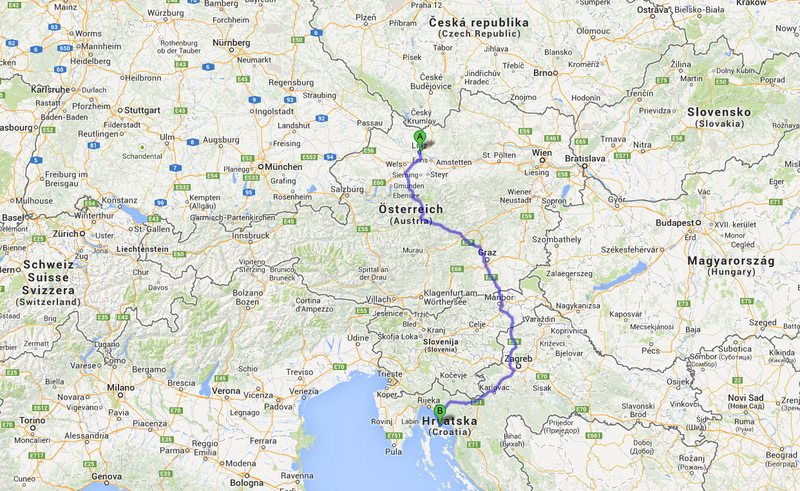 I was approaching the border between Austria and Slovakia when my gas tank lamp flashed on. I figured no problem, because I knew how long my reserve would last and assumed the next station would come soon enough. The highway stretched through rolling fields and small patches of forest, with dense fog and hardly anyone else on the road. The only sound was the humming of my engine. I was starting to get nervous that I would run out of gas, but I found a sign saying gas station in the next town, so I got off and slowly drove through small villages in Slovakia. “Not a lot going on here,” I was thinking. It was the typical countryside; one street and a few houses made a town. I stopped a few times to ask for directions, and I followed some, ending up somewhere else and was getting increasingly annoyed. I just hoped I wouldn’t sputter to a stop in the middle of nowhere. A few minutes later my bike made a gulp, sputtered, throttle didn’t react anymore and I came to a slow rolling stop! Great, now here I was on the side of the road pushing my motorcycle with emergency lights flashing, just hoping the next station wasn’t too far away. A few minutes later I saw an off-road track where people were riding 4×4 trucks, ATVs and bikes through a built course. I stopped and asked around if they could point me to the next gas station, but instead they gave me some gas for free and a Jägermeister for my troubles! Already a plus point for friendly people! Again, a few more minutes and I was in Bratislava, riding past the iconic castle on the mountain and to my hotel. I changed out of my motorcycle gear and started on the streets with my camera and backpack, looking for something interesting and some food. There seemed to be a lot of construction going on. I counted at least 4 high-rise buildings, new roadways and repaving of main streets, which appeared to be good signs of a healthy economy. 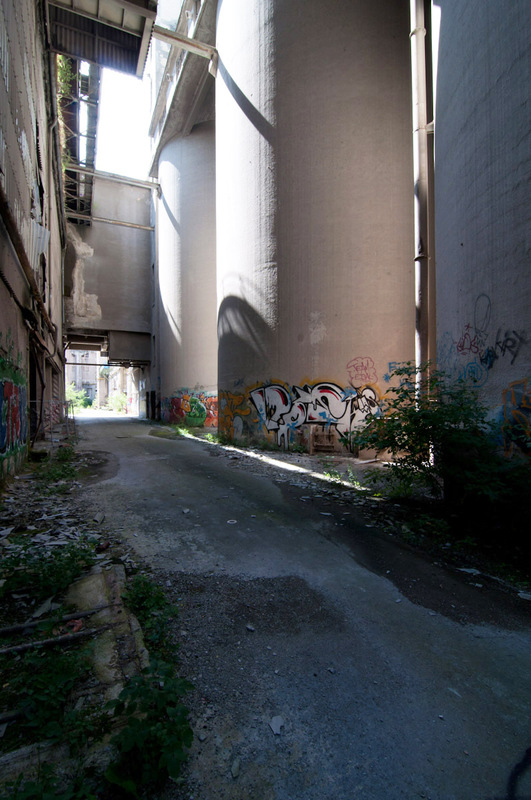 In contrast there were a few old factories and rundown buildings where graffiti artists and vegetation was slowly taking over. Most of the day was spent exploring the old district, going up to the castle and walking around the walls surrounding it. Nice park areas were included with big, tiered layered steps leading back down toward the city, with piles of autumn leafs and brightly colored trees. I went to eat at a restaurant after inspecting the menu, but wasn’t blown away by that particular meal unfortunately. I ended the evening hopping between bars that I found interesting and had a drink at each. Maybe it was only on this weekend, or I didn’t find the right spots, but nightlife didn’t seem very lively in Bratislava. I went to bed late and ended my road trip with a nice breakfast the next morning, and left the city again on a day as cloudy, foggy and cold as the one before. After being frustrated with the cold, rainy weather in Austria, my girlfriend and I decided to book a flight to Ibiza for a summer getaway for 5 days to San Antoni. It’s a fairly small city on the north western coast of the small island. I was hesitant, because it was mainly known for big groups of young people flying there for a party vacation. It has the biggest club in the world and I had a feeling some of that would affect our stay. I was confident though, that there must be alternative activities to experience and other sites to see. I knew that those clubs would only be overpriced to hell, play music that I don’t have a glimmer of interest in, and be packed to the brim for profit so that you end up squeezed between sweaty, shirtless men until the early morning hours. All that was confirmed with later research. Our flight was at 2:00 am and I couldn’t sleep, like before any flight. Once we boarded the plane I was confronted with the most agonizingly tight seats I’ve ever witnessed. I sat with my legs spread to the left and right with my knees borrowing into the seat of my front neighbors. So I knew the two hour flight would be restless with a slightly exaggerated fear in the back of my mind of a blood clot forming and killing me. Not sure if that would have been that bad though, when the front passenger started to repeatedly try slamming her seat into me while I was telling her “no luck this flight, sorry”. Then of course she is the one getting pissed. When we arrived at our hotel after hopping off the transfer bus, it was 6:00 am and the receptionist told us check-in is only possible after 2:00 pm. We were exhausted, had no sleep and now had to wait eight hours until we could even get to our room. An odd start to a vacation that was already hard on my current financial situation. Slowly regret was creeping in, but I had to make the best of it. We ended up sleeping on the beach during the morning hours, bound to our possessions, to make sure no one stole them. We did find a 10 euro bill in the sand that paid for breakfast when the supermarkets finally opened. The first day was spent occasionally power napping and strolling through the town exploring the possibilities of activities and places to eat. Our dining experience that evening was uneventful; the food wasn’t that great, and while eating, pesky salesmen walked by trying to sell sunglasses, hats and hair accessories. That was our experience at most restaurants and two out of three times the service took forever. More signs that were making me doubtful of my decision to choose this holiday destination. We went to bed and slight feelings of regret were keeping me up awake although I was exhausted due to sleep deprivation and a lot of carrying bags around and walking through town. The next day picked up though, the weather was clear blue skies and hot temperatures so we decided to explore the beaches in walking distance. There were only two choices really, one big one next to the harbor which was fairly dirty and the water oily from the ships, and one further away, but still busy with a lot of people. There was sand, and walking into the water was also easy. The second one became our beach of choice to go to when we wanted to relax and lay in the sun. 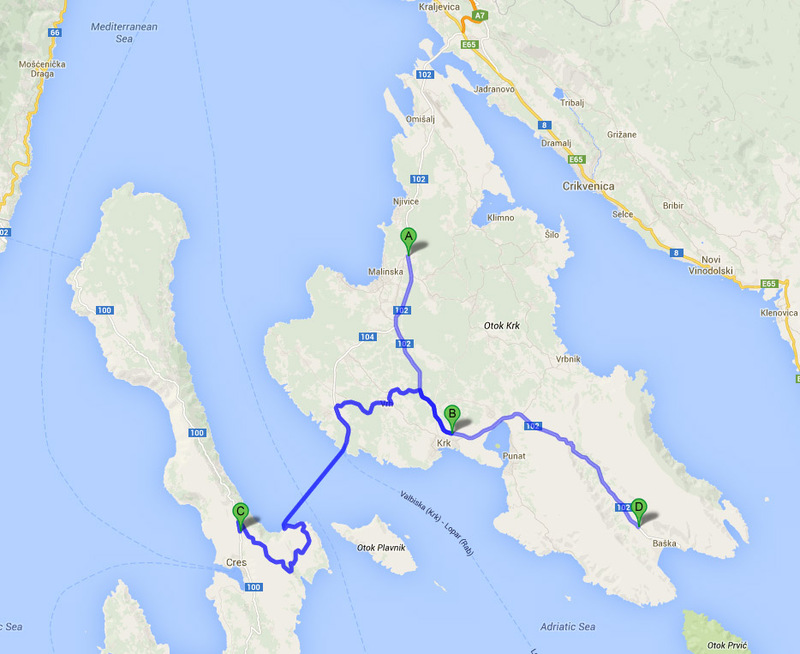 Day three, we wanted to see more of the island, so we rented a moped for a day. 14 Euros for each of us was a good deal and we took off riding down the western part of the island, where we were told are smaller beaches with less people. That wasn’t the case, because there were still plenty of others around us, but the spots seemed more untouched and natural. Also there was no club music thumping in the background, even better! That day we were at 4 beaches; Cala Bassa, Cala Conta, Cala Moli and Cala Llosar in the evening. We ate lunch in a small pub in Sant Josep. They served tapas and cheap sandwiches which were good compared to what we had so far. A few other aimless excursions through the landscape, and screams from my girlfriend claiming to be convinced that we almost crashed numerous times on the curvy roads, concluded the rest of the day. The sunset was claimed to be the most spectacular at Punta Galera, so we used our mobility to get there on a gravel road with giant potholes. It was worth the risk though when we sat on a rock looking towards a big rock formation reaching towards the horizon. We even saw a dolphin emerging from the water, which caused a lot of people to gasp and point. An idyllic ending to a more adventurous day than only laying in the sun. On the fourth day, weather changes were becoming observable so we decided to take the bus to Eivissa, the capital of the island, about 2.50 Euros each. There were older buildings, historically more interesting sights and more alternative, cozy restaurants and cafes compared to the city we were stayed. This seemed like a better destination for families or older travelers not interested in the party scene of Ibiza. The old district was surrounding by castle walls elevated slightly on a hill next to the ocean. It overlooked the city offering great views towards the airport and the harbor of Eivissa. On the last day, we both had our first experience with scuba diving. It was offered by a crew of divers who sold us a different story than what we got. Visibility was nowhere near 30 meters, and we didn’t start in shallow waters as advertised, but got in the deep water right away. We only had one instructor, instead of three which was promised to my concerned girlfriend, and total dive time was also a lot shorter than what we were told. Still it was a nice experience although we didn’t see anything exciting underwater, and due to winds, we had to drive on a cramped bus to the other side of the island. For 65 Euros it was affordable though, and although frustrated with them, I didn’t feel completely ripped off either. Floating around underwater being able to breathe is a unique feeling which is what I mainly paid to experience. Conclusion, it was an interesting vacation and we made the best of it for what it was. At first I didn’t expect the club scene to be the most prevalent thing there, but it seems like that is what most people are there for. There are constant promoters on the street and the 8 or so clubs on the island have parties daily. With that come a lot of drunken people, tons of trash in the streets and loud nights when you’re trying to sleep. All that made a pretty trashy and dirty impression of the city we were in, with empty alcohol bottles stuck in the sand and a lot of obnoxious groups in the evenings. Besides that, the island didn’t have a lot to offer, and I wouldn’t recommend it for families or people wanting an experience outside of clubbing. I also don’t think I will go there again. Still we made the best of it and enjoyed our vacation! Prague is the capital of the Czech Republic in Central Europe, built around the river Vltava and offers interesting sights and activities for tourists and backpackers. They also have reasonable prices and still use the Czech koruna, because they haven’t accepted the Euro as currency. There are affordable, centrally located hotels and hostels. We ended up paying 70€ (~2000 koruna) per person in a 4 star hotel for 3 nights, which included a giant breakfast buffet. Tickets for public transport are also extremely cheap. Single tickets when entering cost only 1€ and connect you to any part of the city and its outskirts. The urban design of the city is laid out with big green parks for recreation and relaxing in the sun. Pedestrian zones are all over the city for strolling through the old town and iconic buildings and making it easy to explore. Prague is mainly known for the Charles Bridge, Prague Castle and the oldest still working astronomical clock tower. Those 3 things are the iconic image of the city, and there are plenty of souvenirs, paintings and photographs sold everywhere near of those locations. That makes them also the biggest tourist traps. We ate at a great vegan restaurant, www.lehkahlava.cz which offered a long list of different meals in a dining area that had the best interior design I’ve seen in a long time. I’d feel bad for not giving them a thumbs up and mentioning it here, even if it seems like blatant advertisement (I’m not getting paid for this, haha). 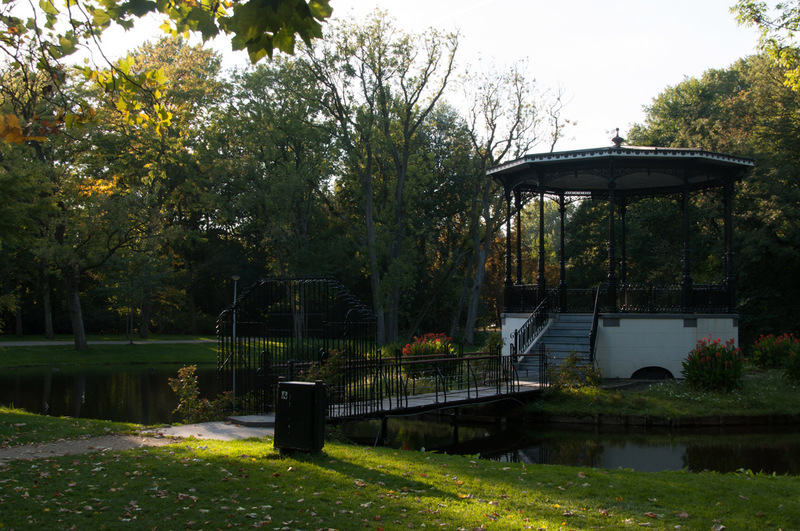 Across the river, opposite the Old Town Square and main part of the city is a giant park called Petrinske sady. It has a steep slope with Petrin Tower on top, which gives a great panoramic view of the place. It’s just south of Prague Castle, and makes for a nice daytrip on a sunny day to picnic in the park. We also visited Prague Zoo, which took about 7 hours to walk through all the animal enclosures. They made a good impression with giant habitats, humane as possible treatment and cleanliness, for locking up exotic animals and charging people to visit and goggle at them. I took that opportunity to spice up my photo collection with more animals. 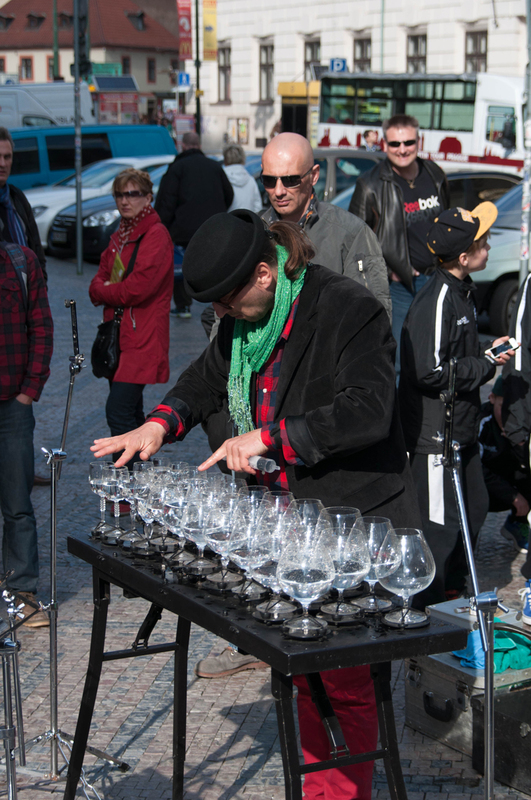 On Sunday night we decided to go out for an evening in town, and went to a bar that was recommended by a local glass musician who makes music with wine glasses filled with different amounts of water. So I had a feeling it was worth a visit. I can’t remember the name of the place, but it was impossible to even tell there was something in there – we even walked past it. The windows were darkened with drapes and the double door was also not lit, and it didn’t have any signs drawing attention to it. Inside it was dimly lit and had two areas, one for smokers and the other for non-smokers. The furniture was all random and seemed like it was taken and recycled from people that were going to ditch it. Wood pallets were crafted and stacked to make benches to sit on and there was even a wood-burning stove. The old walls and intimate feeling made it a great place to grab a beer and listen to a live band that inspired other musicians present to just go up and play along with them. We stayed there most of the night, then visited an Absinth Bar that offered about 15 different kinds to taste. On order, the ritual was performed in front of you which involved a sugar cube and fire. Then you could sit down in the tiny place and start sipping your absinth with a giant mug of water to chase the extremely bitter and burning taste of it. Feeling tipsy and certainly not hallucinating like many believe, we left and strolled further aimlessly through the night before going home. I’m sure a nightly snack was also involved along the way. Named Die drei Flüsse Stadt, translated roughly to The City of Three Rivers, is located in southeast Germany, near the Austrian border. 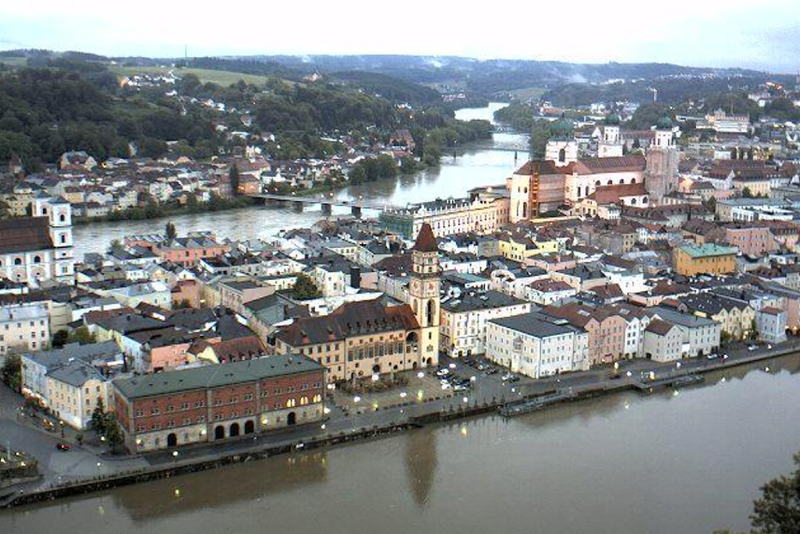 To the north of Passau runs the Danube, to the south runs the Inn. And at the tip of the old town district of the small city, the Ilz runs into the Danube, which flows through Austria and ends in the Black Sea. 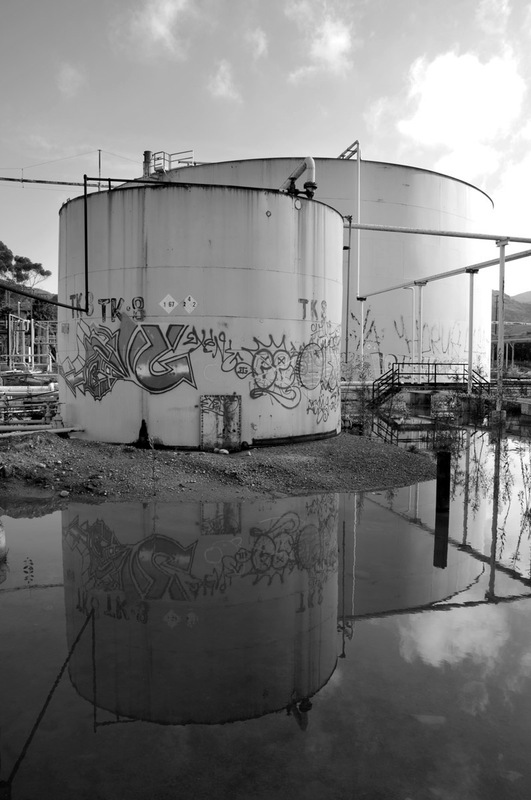 This unfortunate location, during the flood of the summer of 2013, made the surrounding waters rise up into the city, damaging property and leaving a lot of the old buildings ruined. During my visit in February 2014, I observed ongoing construction and restoration work. While walking through the old town you could see obvious watermarks all around which gave you a scale of the damages, and helped visualize how deeply submerged this area was. The parking lot had pictures hung up as a recent reminder of what this small quiet town has gone through. 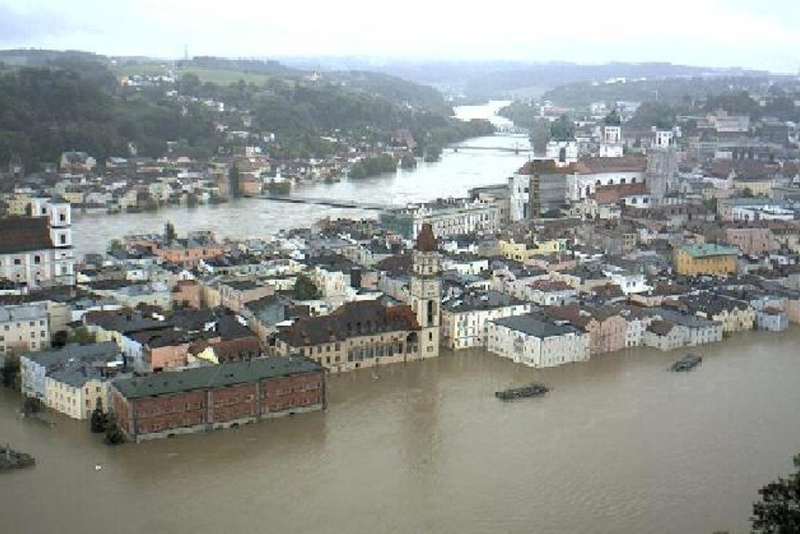 According to media and weather experts, the flooding in 2013 was the worst that has hit central Europe since the 16th <span century, costing at least 25 lives and leaving damage all along the rivers in Germany, Austria and Czech Republic. I remember taking the train from Vienna to Linz during the peak of the storm. 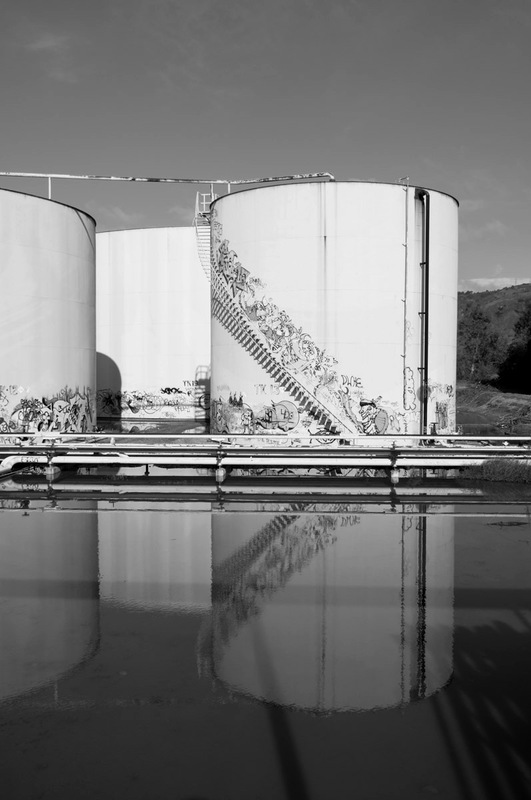 I stared out the window observing giant pools of water forming everywhere; flooding agricultural farmland, highway underpasses and surrounding towns with masses of water disrupting daily life. A few days later, the same train was shut down for a short period, because one of the tunnels was filled with water and trees that were uprooted and swept away by these natural forces. I am glad to report that the city has recovered well. Visitors to the city have returned to see the old architecture and to dine at the numerous outdoor restaurants. For me it was a day trip with my girlfriend. We just spent most of the sunny day outside walking through the streets, stopping here and there for short shopping sprees. In our opinion the town was small enough to see in a day and certainly had a nice flair to it, which makes it worth a visit! 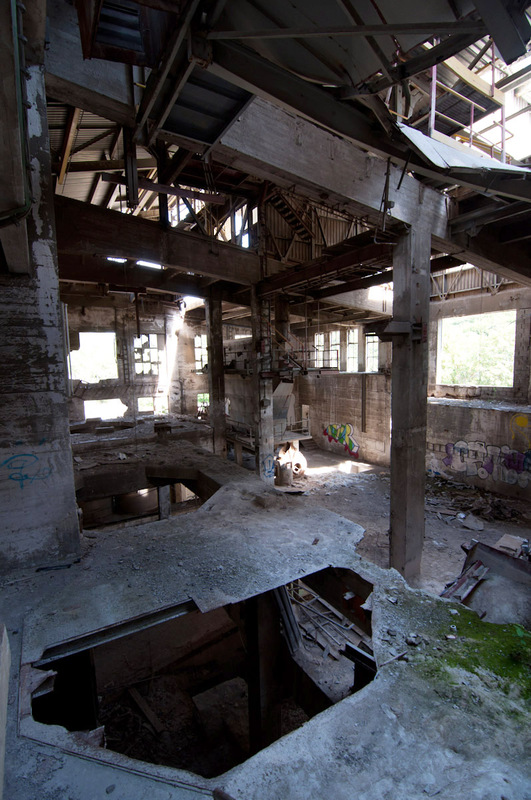 There is something oddly satisfying when exploring abandoned man-made industrial machines and buildings, after human presence neglects the structure and there is no more activity and it is left to rot, rust and decay. Nature slowly reclaims it, breaking it down piece by piece. 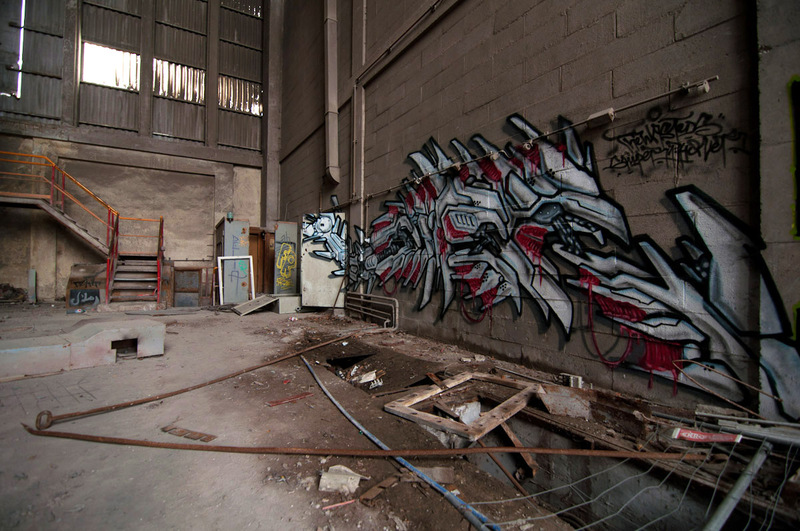 Artists come, cunningly ignoring the no trespassing signs to find blank canvases hidden from authority, with which to create amazing and complex murals with paint and spray cans. 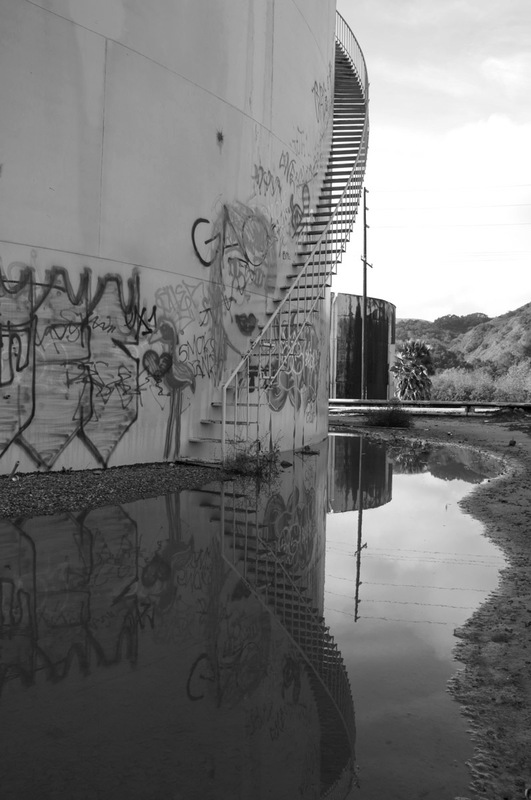 Skaters find a place to build routes and ramps, and paintball enthusiasts have a battleground to conduct war. In the end it is not really lost, it just gets used in another way by the community until someone buys it to tear down and rebuild something new on the property. But that process sometimes takes years. 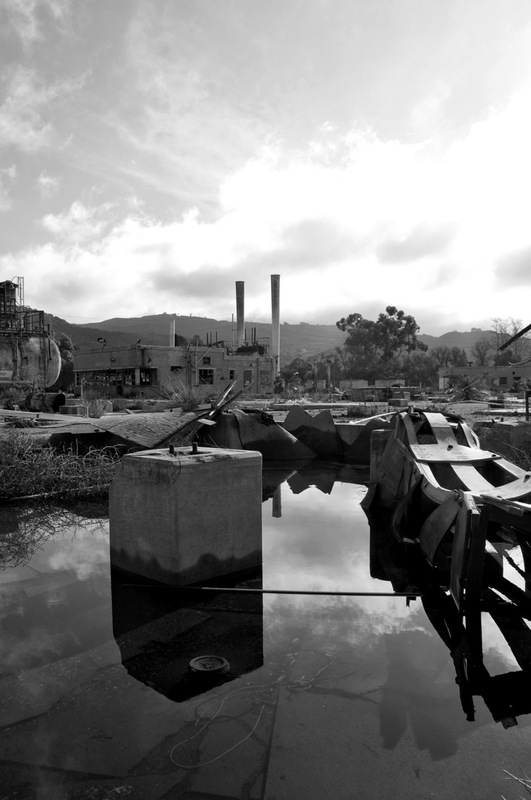 I enjoy walking through these “wastelands”, not knowing what to expect around every corner. An eerie feeling surrounds you, as if you are scavenging through a post-apocalyptic world trying to find shelter and items to survive a zombie outbreak. Obviously, depending on where you explore, there should be some safety precautions before engaging in such an activity. There is constant danger of collapsing floors and sharp objects everywhere you step. Homeless people and drug addicts could also be housed in bigger structures, so be aware and listen to what is going on so as not to put yourself in danger. Headlamp, sturdy boots and a particle mask would be recommend for toxins like asbestos and mold spores. 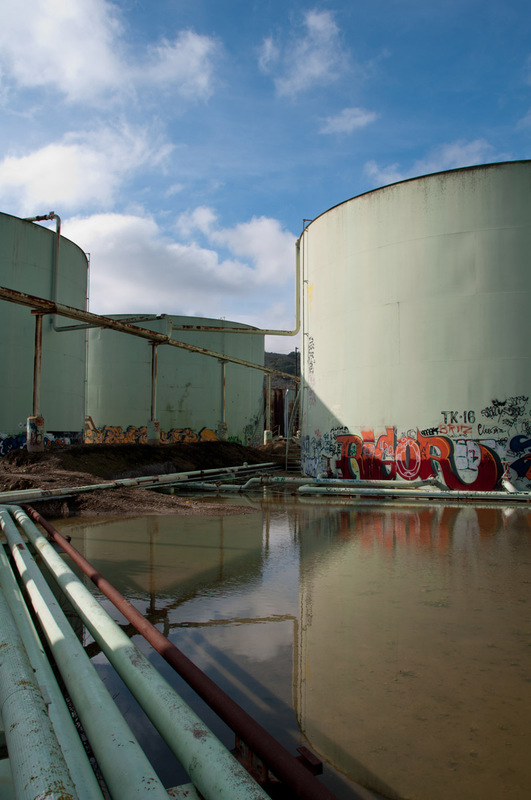 I’ve been fascinated by this hobby after exploring Ventura’s abandoned oil refinery near my home. It was there on the side of the freeway every day on my way to work, until I finally had the idea to take a look inside. I did that on a few occasions at different times of the day, and after heavy rainfall to get some nice photo shots. 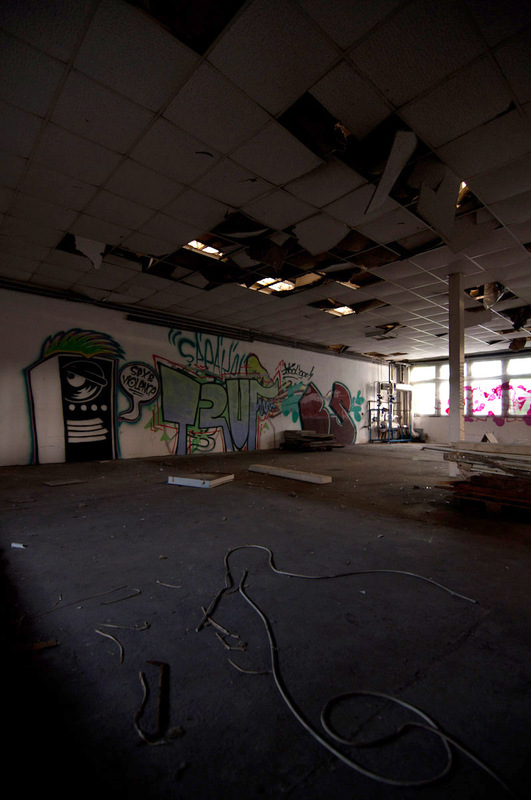 I’ve explored five similar structures so far, the most impressive being a giant metal refinery with three large office buildings, all abandoned with office equipment and old items laying around. 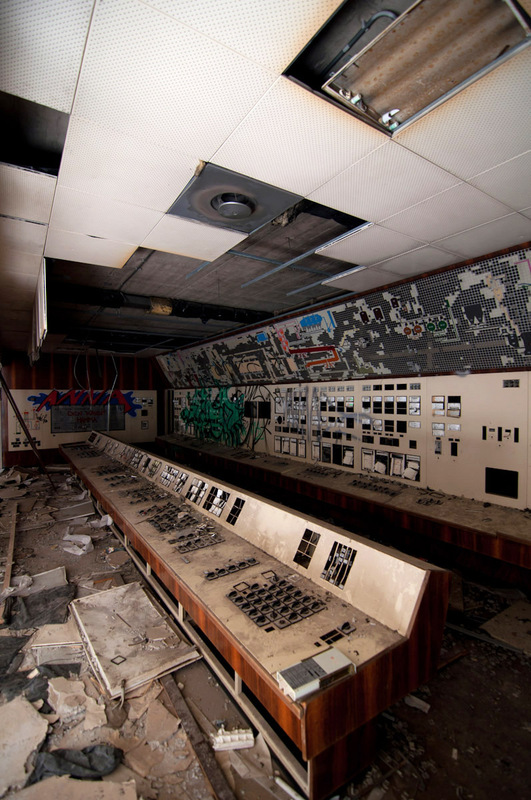 I had to enter through a gate, and then climb a broken window that was at shoulder height to eventually drop down in to the reception area where there were switchboards and telephones. It’s a unique taste of adventure. There were multiple floors to explore, old electronics and a lot of sketchy situations that needed careful attention on the sturdiness of the structure under my feet. I enjoy the aesthetics of black and white photos that can be captured in these places and look forward to more exploring! Landing at the airport in Schiphol with a tingling sensation of excitement, a spontaneous 3 day vacation with friends was waiting in Amsterdam. We boarded the train heading to the central station to meet up with the others who arrived a day earlier. 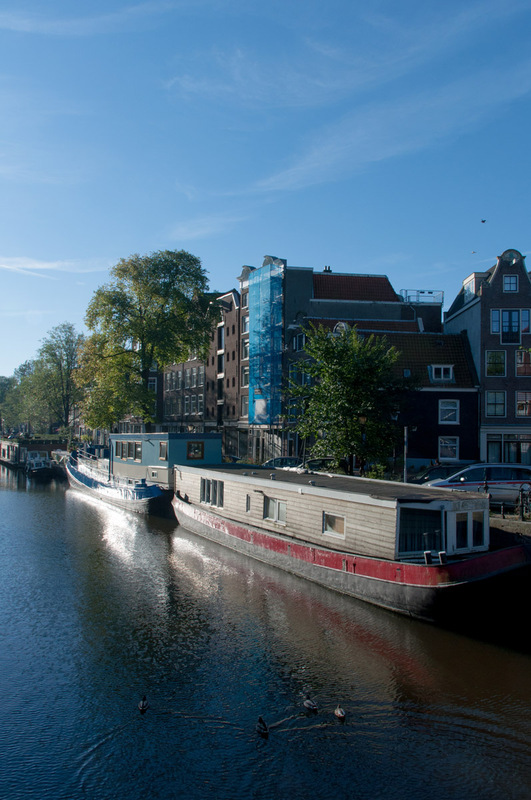 We got a great deal on a houseboat, just 10 minutes slow strolling distance from the center of town. A bedroom and couch bed provided enough living space to be called home for a short time – plus smoking was allowed inside, a big plus I suppose? The boat was surprisingly roomier than expected with high ceilings, another bonus for a big guy. The first thing I noticed was bicycles everywhere, all the time and at high speeds cutting through the city and up and over canals. 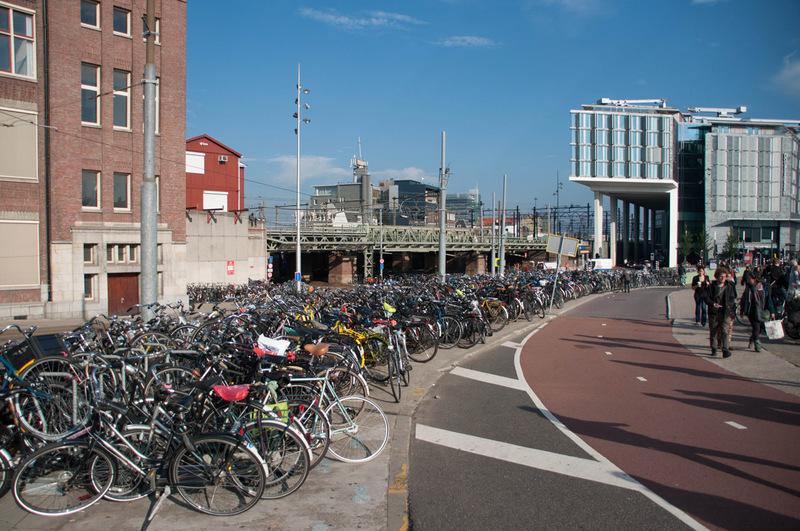 The main train station alone had racks with ~4000 bikes chained to a 3 story parking garage, and the city is estimated to have a total of 900,000, yes it’s a lot. I enjoy mountain biking but it seemed a little bit scary to rent a bike and cruise through the city like the others, but in hindsight I do regret not doing it, I think I would’ve seen everything from a different perspective and have experienced more. Next time…. We stopped by a few coffee shops, each having their own flair to them. A lot were packed and noticeably pricey establishments with elaborate decorations or glass floors with ornaments you walk over. Each place offered their own menu of smokeable treats, either in a bag or pre-rolled and ready-to-go. Most locals from what we observed just bought and left, understandable I guess, why hang out with the loud tourists walking around amazed by the relaxed drug laws, I am sure that becomes annoying after a while. Most shops offer a list of beverages and also good food. In the morning you can come for a cup of tea, coffee or breakfast items, in the day and towards the evening the selection widens to sandwiches and other meals when you get the munchies. Other shops offered a more basic setup and were noticeably cheaper hole-in-the-walls. All they had were cans of soda, seating for 10 people on rundown wood furniture, and a small selection of low grade weed, which are probably top notch compared to what many think is good back at home. We eventually got tired of hopping around between the shops and continued on to stroll and take a bus through some of the streets. 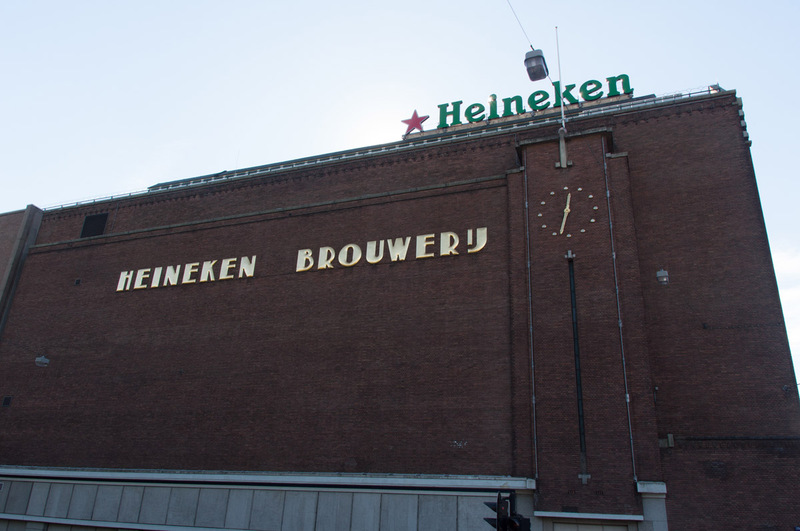 We stopped by the Heineken Brewery, which to be honest just wasn’t worth the money and an obvious tourist trap. I do feel like it’s the best beer in the world now because they convince you of that fairly quickly. I found the tiny 2 seat cars that fly by the streets and parks extremely funny for some reason. 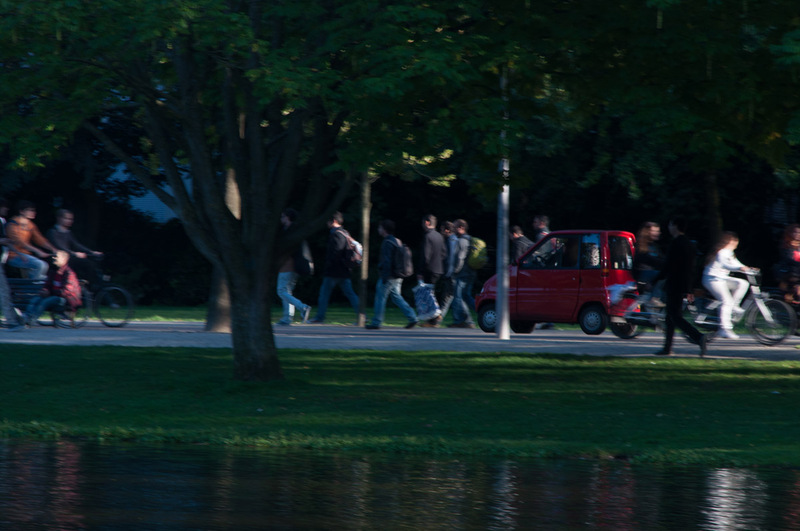 They were smaller than a smart car, built for tight streets and parking spaces, which I can imagine is very handy in this city. We continued on aimlessly through the canals and walked around in big circles at Vondel Park, where a lot of people were keeping up with their fitness routines; jogging and biking through the area, or couples romantically sitting around the endless benches under the shade of trees. I found the architecture of the city spectacular; the buildings all had very odd angles giving off a quirky illusion of leaning forward and sideways. At night a lot of the canals are lit with lights decorating the sides and the city is still very awake with a lot of people out and about. I noticed a lot of British people were there on vacation, which isn’t too surprising considering they aren’t too far away from the country. The next day we stopped by the large Albert Cuyp market, that sells local food and cheap knockoff clothing. We loaded up on some supplies, mostly bread, dried meats and a few cheeses which the Dutch are famous for. 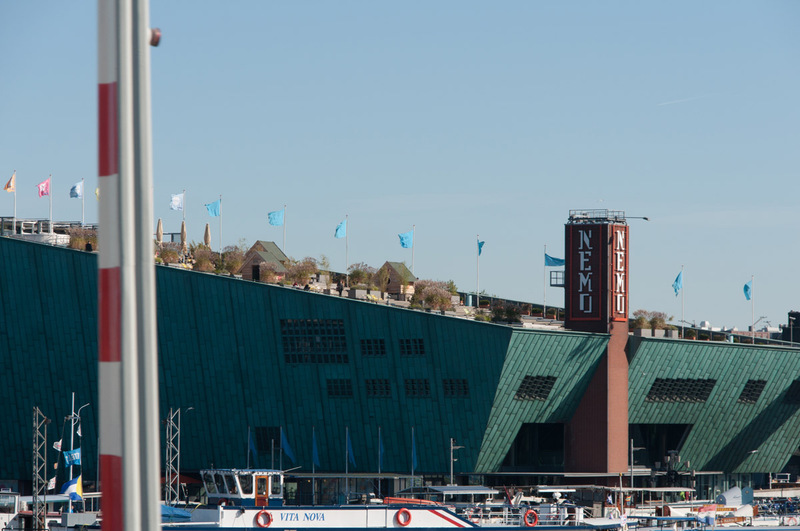 After lunch and rest back at the houseboat, we planned our next visit to be at the NEMO Center, I wasn’t too thrilled by it because it didn’t seem like a very unique experience, but I didn’t have any better suggestions so I tagged along. It’s a great place for a couple or with your kids, there are a lot of scientific demonstrations with do-it-yourself devices that play with gravity, mirrors, water, games and sexual information. All spread out on 3-4 floors, in the middle a giant “Rube Goldberg” device that gets set off at certain times during the opening hours. It took about 2 hours to get through half-heartedly interacting with the displays when it wasn’t necessary to shove away some small pesky kids to have our own turn at childish fun. After that we went to eat at the Sea Palace, a fitting name for a gigantic 3 story high, floating Chinese restaurant. The interior was very well designed with a lot of patrons at the tables. I don’t know much about the cuisine, but there were a lot of business men speaking Chinese on the table next to you so it seemed to be authentic. The menu was overwhelming with hundreds of choices, and it took a good half hour and a few appetizers and soups until we even knew what we were looking at, and half of our order was unknown until they were served, and even after consumption uncertainty remained. But still a delicious place to eat, although admittedly pricey in my mind. We took a longer stroll through the alleys on our way back to the houseboat, stopping by some small shops for postcards and t-shirts as gifts. The same night my friend and I visited a Goa party, which for me was obligatory to take advantage of while there, and the couple we were with had an evening to themselves. I stomped through the night in good spirits, with the music and visual projections next to me, until oddly enough the music all of a sudden stopped and the lights were turned on and the crowd clapped enthusiastically and left the building in a civilized manner. I guess that’s it, we were a bit perplexed because I am usually used to the music not stopping until the morning light. So we walked back through the cold night to our houseboat for the last night in Amsterdam. The next day we started off with some Irish breakfast in a pub, there wasn’t too much more we could think of doing. 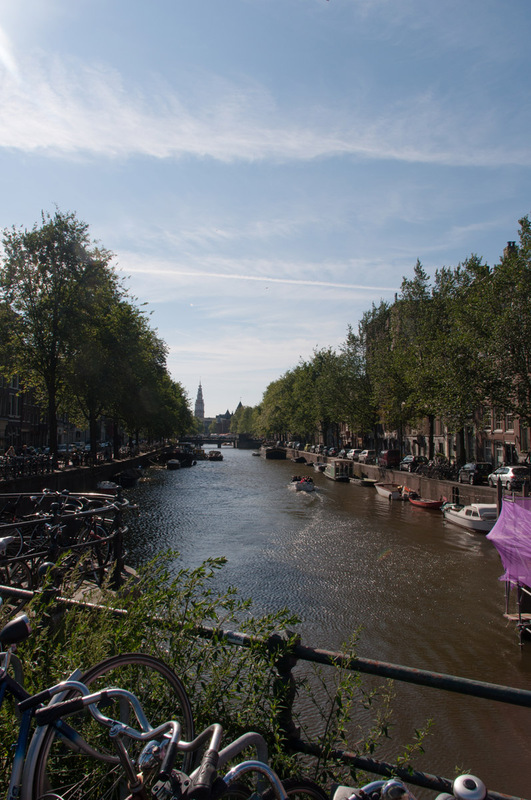 I was starting to get sick and wasn’t very motivated to do a lot besides walk around and enjoy some of the last hours in the sun of the summer near the canals, listening to the locals talking. Another place that was high on my to-visit list checked off, and I am happy for the experience I had. The only thing I would do next time is get a bike and explore more outside of the inner city canals. Also watch out for the bicyclists, they will run you over if you don’t look in all directions all the time! A chance to drive down to Croatia with an amazing girl offered itself as an opportunity in the summer, before the winter and cold had a chance to surround and engulf Vienna, Austria. We planned our route by car, from Linz through the mountain range, down to the island of Krk – a popular destination with its own airport. People often camp, taking their RVs and families for vacation. Total drive time, ~6 hours. We were wise to plan our departure earlier than when schools had summer break, to avoid huge crowds. The freeway system charges for entering and exiting on and off ramps at toll stations, which I’ve heard can be horrendous in the peak season, with cars waiting in the lines for hours making trips a horrible ordeal. 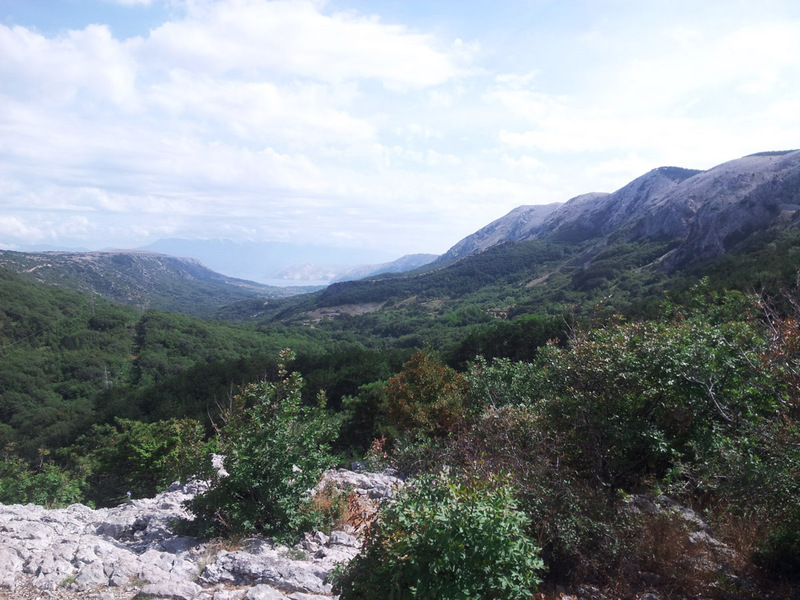 We were lucky to breeze through parts of Slovenia and Croatia with no real trouble, albeit the toll stations just from Linz to Krk, which surprisingly did cost quite some money – more than I had expected. Gas prices are also high in Europe, so it is hard to say if a road trip is really worth the money, being that cheap airline flights are becoming more and more prevalent. The drive was nevertheless nice, we had a summer mixtape blasting and life was good. Finally off work and carefree for a good week, we turned a last bend and saw the ocean. 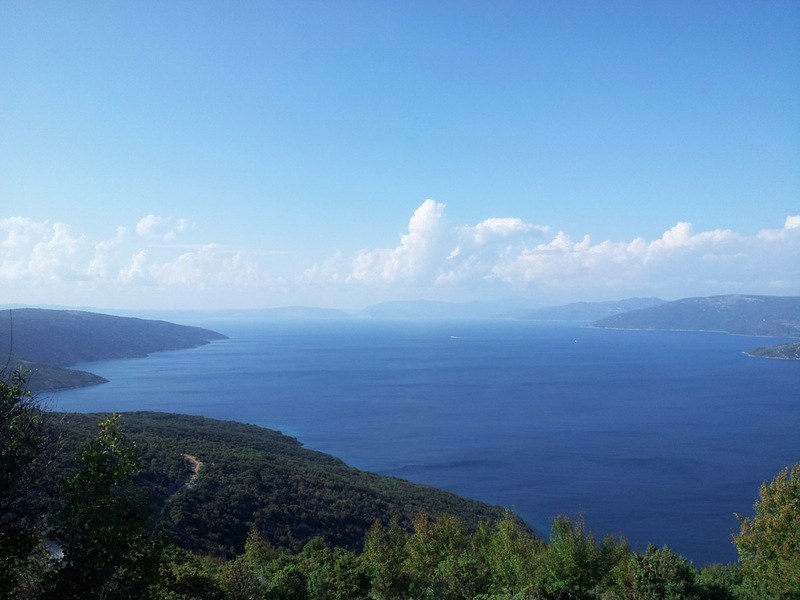 We were high up in the mountains, slowly driving down the winding streets following a lot of German license plates in a chain of cars all heading to the same island. I am not much of a beach person I must admit, and my companion showed a lot more excitement and enthusiasm for laying around and sunbathing all day. I could only muster a half-hearted agreement knowing that I won’t stand that for long, but we agreed on making this a vacation both of us would enjoy. We hadn’t booked any hotels or anything in advance, we just figured we would stay where it looked nice and at a place that catches our eye. Our first stop was Malinska, a town that had mostly carved out cement steps resembling areas to lie down, lots of restaurants and a strong boating community offering tours. It had nice winding roads going up and down the small town between tightly built houses. Though there were a lot of families with loud kids running around. 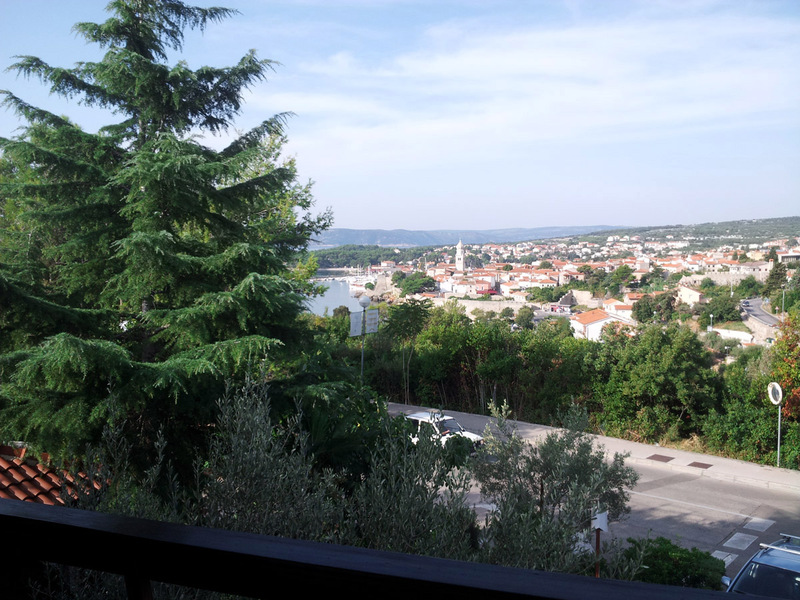 We drove out to the next town which was Krk, where we ended up parking and exploring. It had a nice feeling to it, with the buildings and main city streets flowing right next to the ocean but on a ledge higher up. Old castle-like walls surrounded parts of the city, and later on we stopped in at a bar that was inside the ruins of an old fortress. We decided to stay there and got a very big apartment for 3 nights, it easily offered enough room for a group of 8 people for an extremely low price. After getting situated we unpacked and headed out on sandaled feet to the water’s edge, built with big cement steps with chances to lie near the rocky shores. Further up the beaches were smoother, but still like gravel. It was easy to get into the cold water from ladders, and the water was very clean and pretty clear. After a round of paddle boating, and a first disappointing meal at an Italian restaurant, we called it a day. The next day we explored more of the city and went to the supermarket to stock up on all the unusual items we could find to consume and cook at home later. Then another round of lying in the sun like salamanders and a walk through the streets. Towards the evening, we settled in a small pub where a Brit was playing guitar with an older lady singing enthusiastically. They played and sang the songs in a drunken fashion. Next to them two Germans were escaping their life at home after both divorcing their wives. It was the best spot we found to relax and enjoy some drinks well in to the evening. At some point we left because the Germans were becoming extremely annoying, one hugging and breathing in my face, stories of how much of a whore his wife was. I believed him, but I am sure he wasn’t completely innocent either. How could anyone stand this guy let alone marry him? 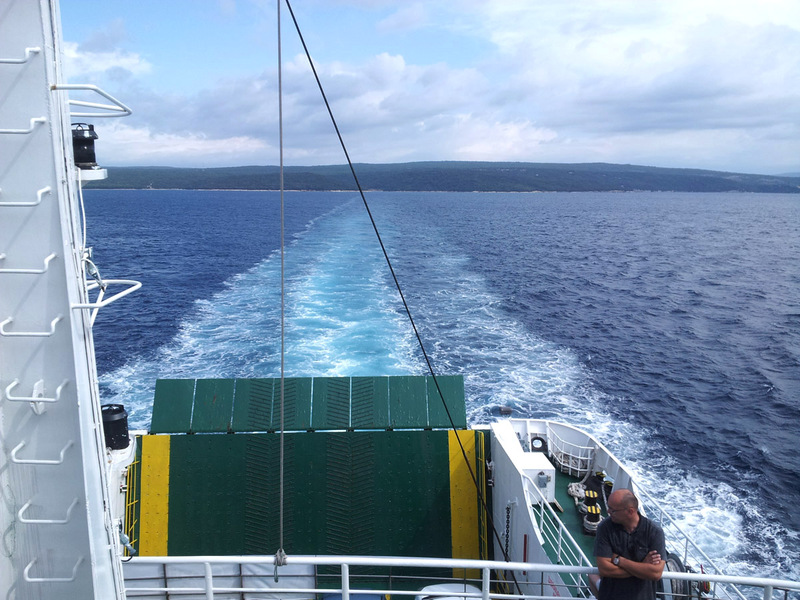 The next day we embarked on some more driving, and took a ship that was able to transport us and the car across to another island called Cres. It was a bit more remote, with small villages and a lot of free-range sheep in the mountains. The food was a whole lot better and we found small corners with less tourists so we could enjoy our time together strolling through the streets. This island was more rugged and wild and we hiked around, exploring the different small paths in the mountains with abandoned buildings and a small church. We ended up in a tiny town at the bottom of one of the cliffs. There was a parking area at the top and we slowly walked down steep steps snaking through small balcony houses. 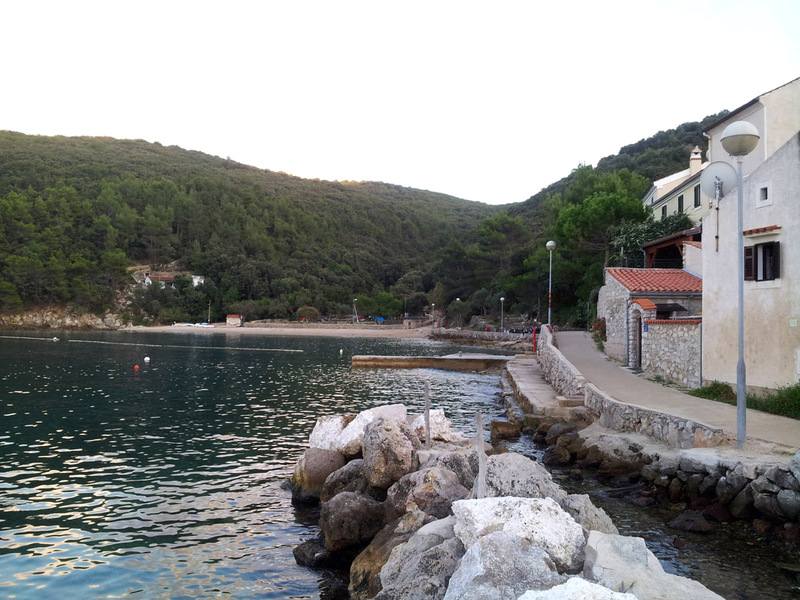 Finally we reached a small harbor and town with a giant campground and a tiny beach off to the side. We had that area just for the two of us to enjoy, and we relaxed there until the sunset. 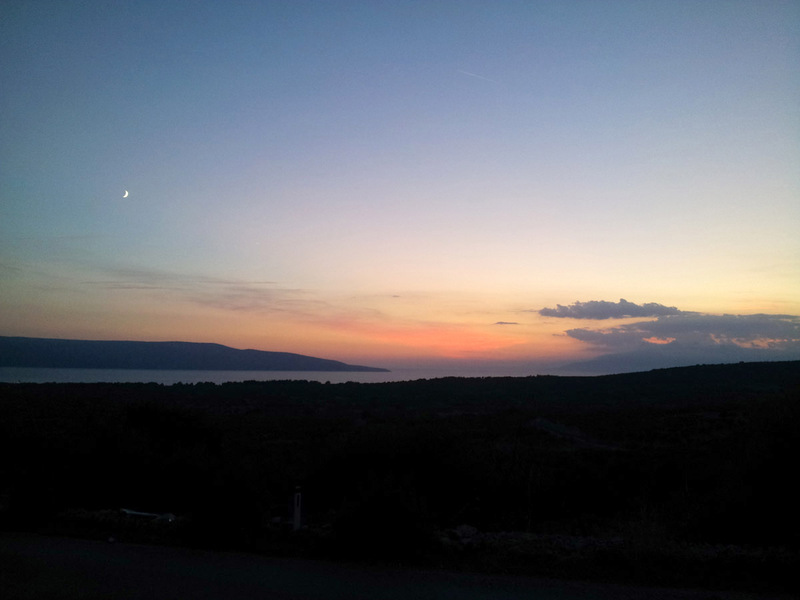 At nightfall we returned to the dock and took the ferry back to Krk. It had a spectacular view from the top deck. In the distance huge clouds were forming and a giant thunderstorm with lightning was hitting the water. We could view it from a far and dry distance. Back at our room we enjoyed dinner on the balcony with huge rainfall and loud thunder roaring all around us. We went to sleep hoping for better weather the next day. Sure enough it cleared up and the sun returned. 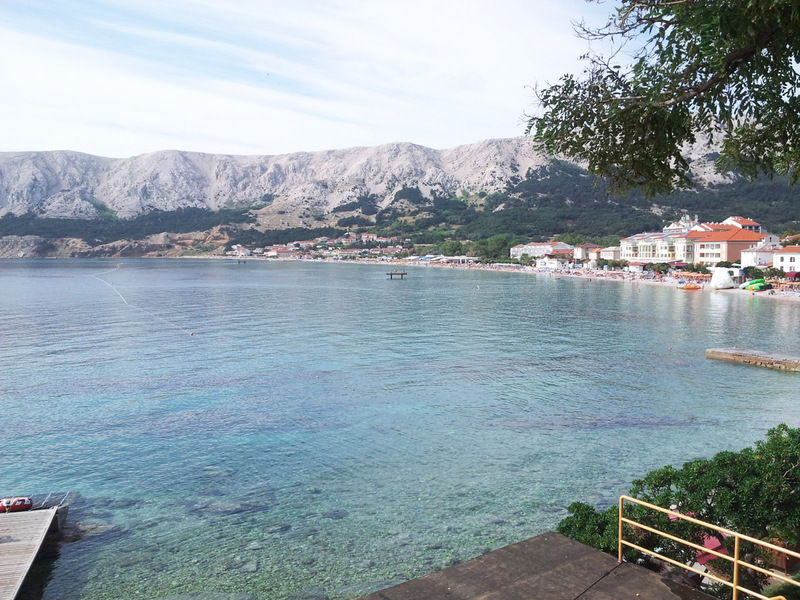 So we drove to the southern tip of Krk, to the town of Baška: a small beach town surrounded by high mountains. It had a lot of little shopping carts with small handmade trinkets and gifts, endless tourist souvenir items, and some cheap food stands. The main attraction there was a big half-moon shaped sandy beach that was packed with people laying shoulder to shoulder, drinking and having a good time. To my horror in the background there was a bar blasting top 100 hits and the epitome of bad electronic music artists. A ridiculous amount of the beach was offering sunbathing benches to rent for a day, with hardly anyone using them because everyone in their right mind saw it as a rip-off, including me. Later, after pizza and more unusual tastes of ice cream, we decided to return again for the last night in our room, before heading back home. I’m eager to see more places in Europe, since I haven’t had the opportunity while living in the United States. 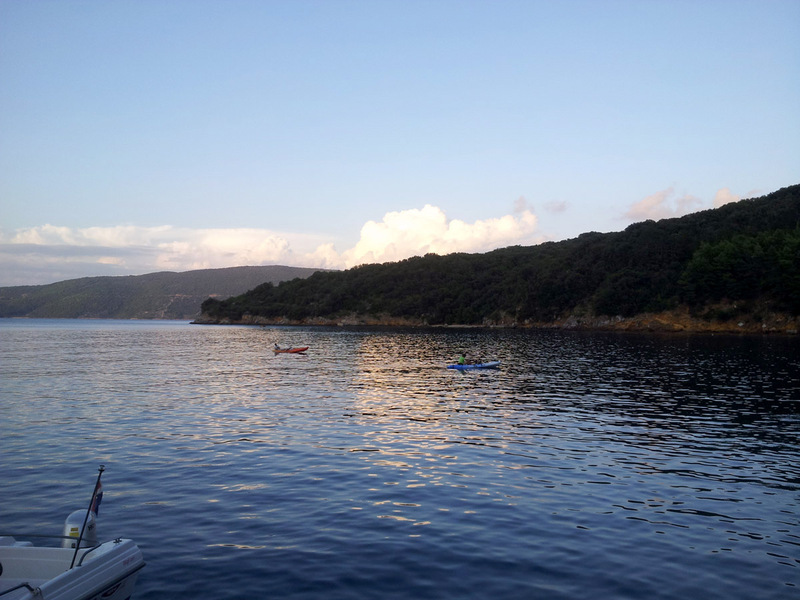 I recommend Croatia to anyone looking for a summer getaway, friendly people, and interesting small villages for a chance to unwind from their lives at home. It’s a country that has many beautiful spots to visit! Now just to start off, this festival is obviously not for everyone. 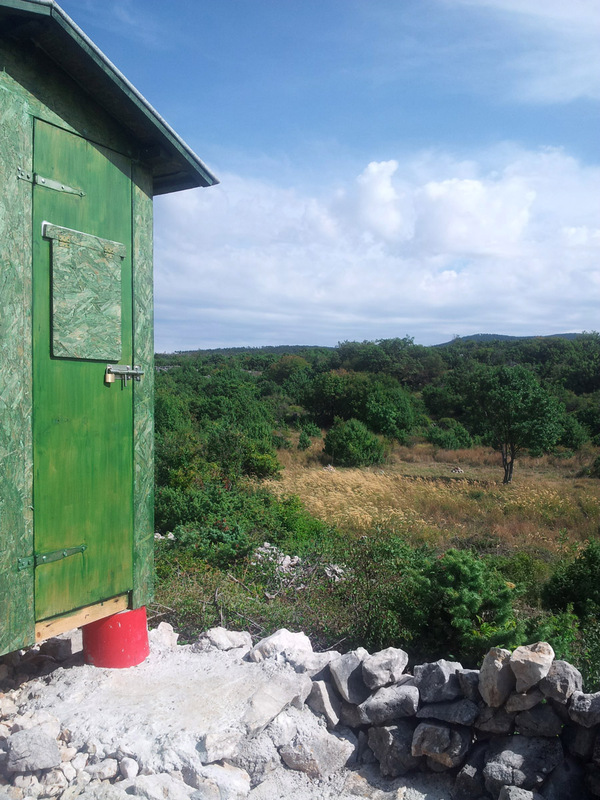 If you are the germaphobic type of personality, scared of the outdoors or generally just timid when it comes to rough living for a week or longer this isn’t for you. To come here will require some sacrifices of comfort, unless of course you are the person who shows up with a remodeled school bus with a Volkswagen Beatle body soldered to the roof and with mechanical walls that extend outward to create a giant drivable living space on the inside. Now I know for most of you that approach is not realistic. What is beautiful about a festival like this, first and foremost for me would be the “vibe” or the feeling you get from the crowd; from the smiling happy people around you and the mix of nationalities that travel from all over the globe to come to such a gathering. The artistic efforts constructed every year to expand and further the decorations, permanent structures, market areas are staggering. 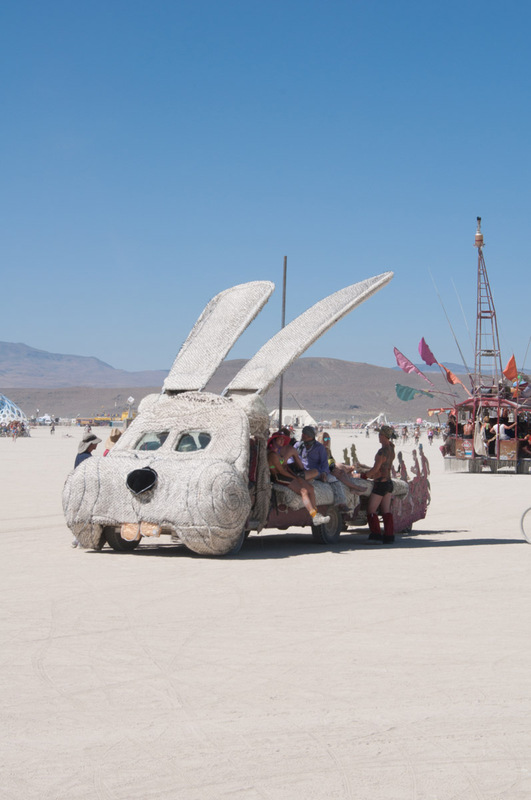 A place called “magic garden” offers visionary art galleries hosting artists like Android Jones and Alex Grey, along with various workshops and lectures. It is a place for everyone, the music styles vary greatly too. 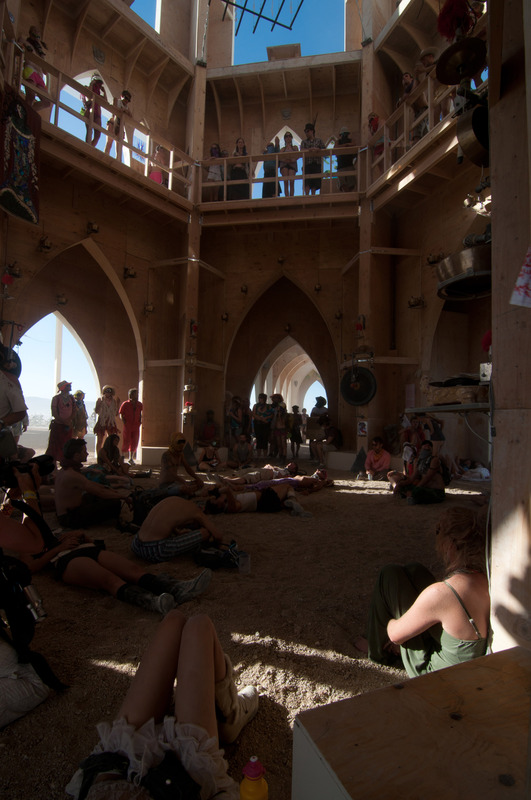 The chill stage which is a gigantic dome structure, offers cool shade in the day and warmth in the night, with a lot of people sleeping or bringing their hammocks to hang and rest. There the music will range from the funky, to the laid back, to the bizarre and even humorous sets of the international artists that get to play. It can easily happen that you wake up to a set where your only thought is what the f*ck are they playing and why does it sound like donkeys? 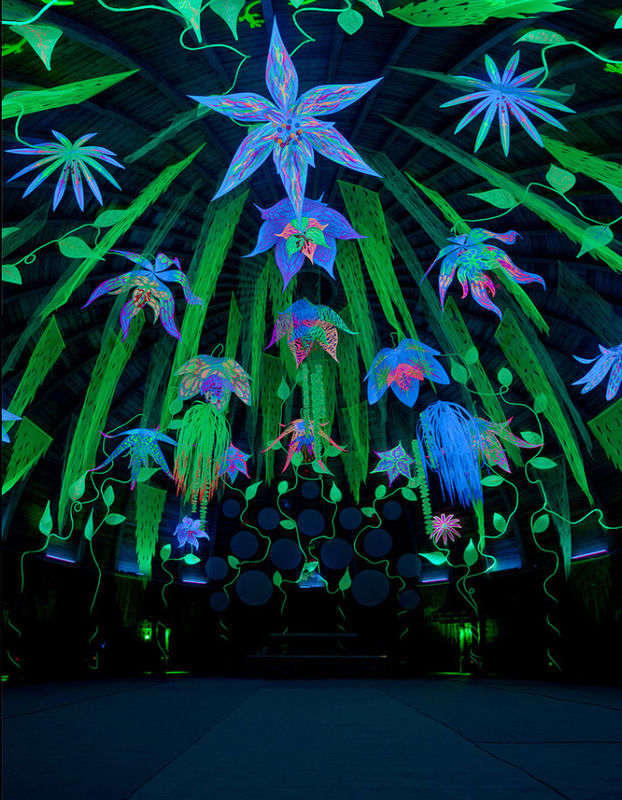 All of this is covered at night by an impressive and slick, still image projection wrapping around the dome with abstract and colorful patterns changing every few minutes, while in the distance people are spinning fire poi to the music. Another stage offers timeslots to up and coming bedroom DJs during the day and a movie theater at night. 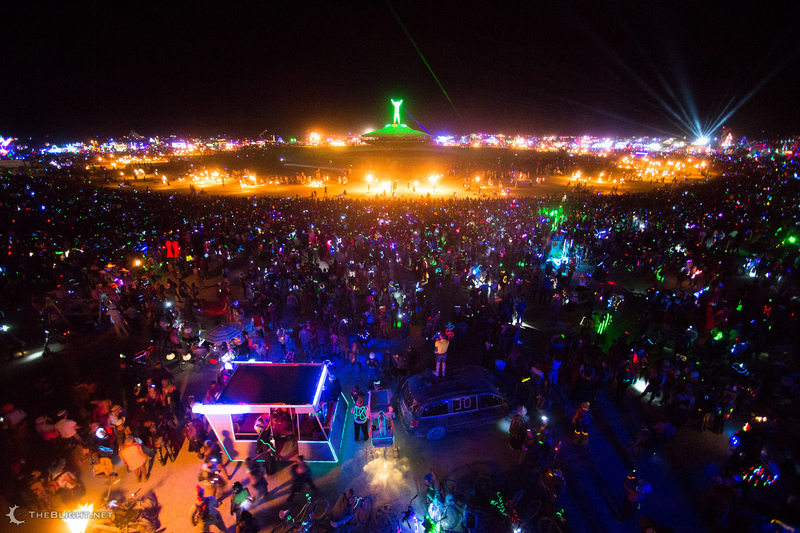 There are a lot of activities going on and things to explore, you won’t really run out of things to do, day or night. Now the main attraction of course would be the main stage, as the name implies. 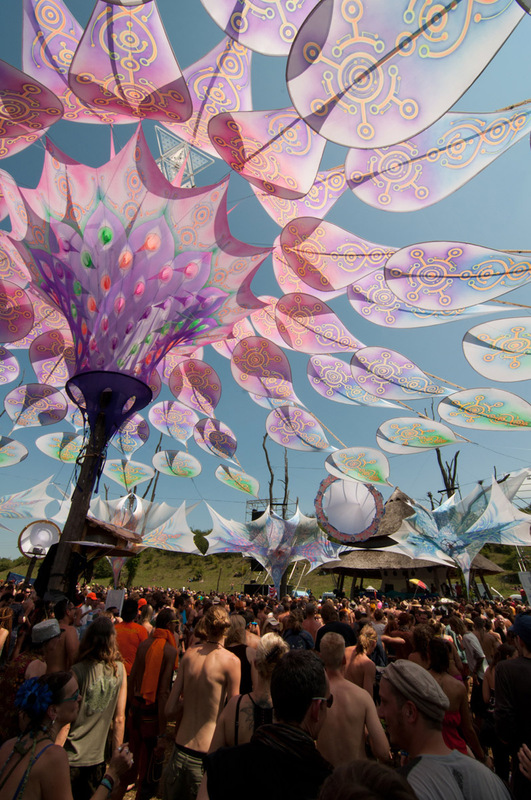 An impressive giant sound system surrounded by a circle of trees that uphold the ever-changing shade structure that hovers over the gigantic crowd. Impressive lighting and projections cover the area, with a fire pit at the foot of the stage to offer heat in the night. Again the music styles vary, from live bands with psychedelic music like Sphongle and Juno Reactor pumping out energetic music that flows through the smiling crowd, you can’t help but move to the beat. A lot of other international acts come up to play, some already a regular every year and famous for their sets, touring the world playing their music. Loud, Ace Ventura, Raja Ram, Zen Mechanics and Flip Flop just to name a few. I can’t accurately describe the music with words and a live performance takes on a whole other dimension. The only lyrics you will hear are mostly mantras, repetitive words, speech snippets from inspirational speakers like Timothy Leary, Terence McKenna and recognizable quotes from movies mixed seamlessly into the beat. When the sun falls, the BPM – beats per minute become faster and faster, the music slowly shifts in to something more sinister and seemingly evil, the lighting flickers and the sensory input of everything becomes more intense. I have to admit when the music goes to what is called Darkpsy, I just can’t take it for long. Your legs are exhausted, it’s hard to keep up with the beat and generally the stage can have a very uninviting, intense tone to it. Usually that’s when you can grab a bite to eat and explore the rest of the festival with a headlamp and an open mind. Strolling through the market place you can buy a wide range of food, fresh squeezed juices, milkshakes, fried goodness, pizza and international cooking. If you prefer “home cooked” meals with a camp stove, then there is a supermarket on the grounds. A lot of clothing shops are available selling glow in the dark gear, all the jewelry and trinkets imaginable, and often rare items from foreign countries that traders set up for sale on blankets. 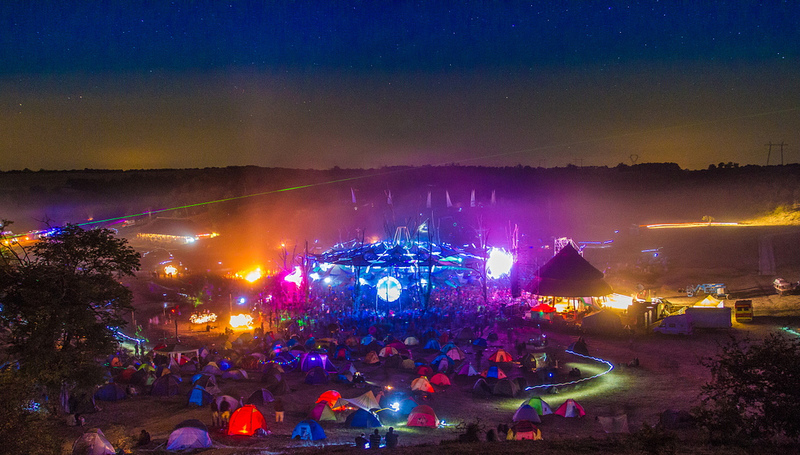 The festival is officially 5 days long, with a lot of people showing up days earlier and staying longer just to enjoy the camping and community, plus all the freaks that come out of their holes to gather in such a society. It has a very tribal feeling to it, a feeling that this is how life should be in many ways. Everyone is happy most of the time, is in a good mood and generally enjoys being surrounded by like-minded people. It is a scene that is replicated all over the world; they have similar festivals in the Sahara desert, jungles of Peru, the wilderness of Mexico and downtown Los Angeles. It will often happen that you will see a person you know from a previous event on the other side of the world, and that to me is beautiful. Now, this festival had a lot of personal significance for me. I was and probably still am in the transitional phase between teenage fun years, and having to grow up and be a man in my own eyes. 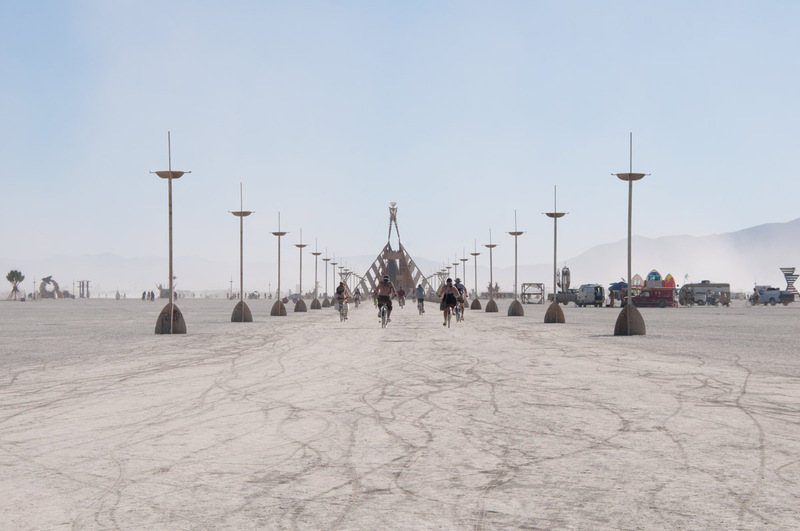 The theme of the year, 2011, resonated with me in all possible ways, being that I always wanted to go, and as a semi art inclined person myself to experience this gigantic event near where I lived, I set out to make it a reality. Dust, will be everywhere. Within seconds of arriving, your whole car will be filled with a layer of dust. It will be on your clothes, your belongings, your face, your skin. You are home now. The first keywords every “burner” swears by are radical self-reliance and self-expression; to basically take care of yourself and not die in a hot dry desert. Of course anyone will help you if you have trouble while being there, but there are certain rules that you have to live by. Take care of your trash or MOOP – “Matter Out Of Place”, which is everything and anything you take in that could drop on the desert floor. Take it all back home with you where it belongs. You want to take a shower? Then you collect the water in a plastic basin to let the sun evaporate it again, because that too is MOOP. 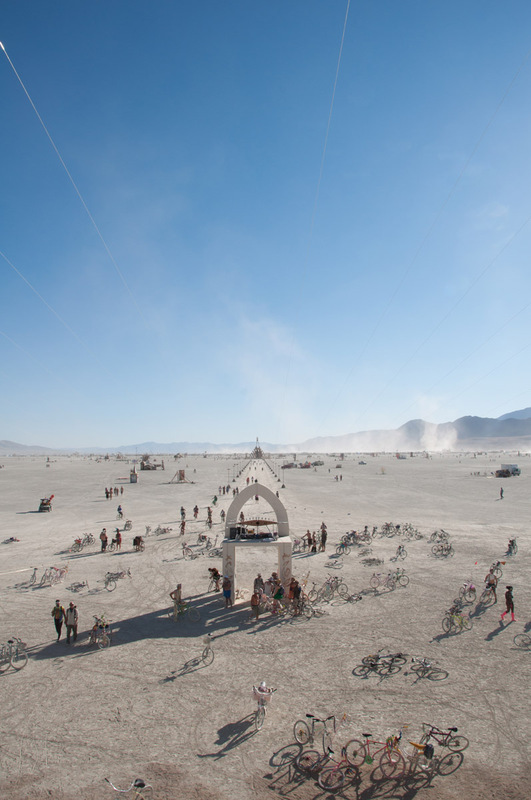 It doesn’t belong there, and the organizers make a huge effort to clean the whole Playa again after everyone leaves, to insure a permit for the next year. 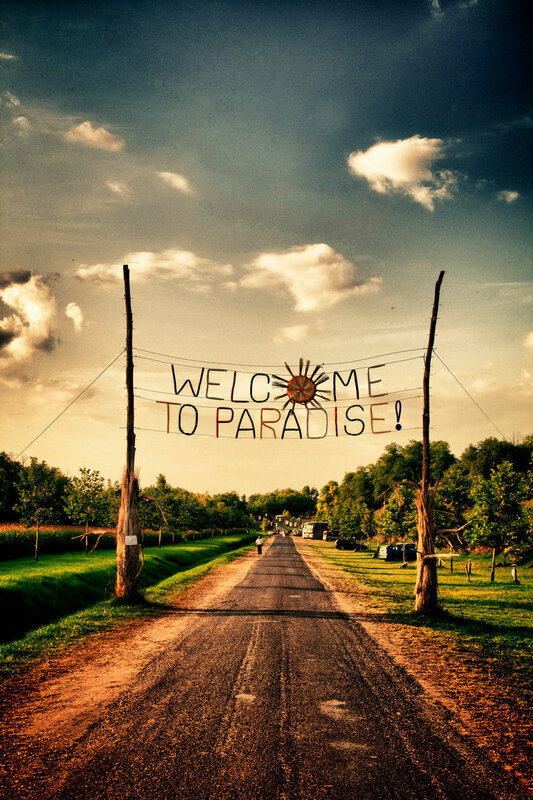 So needless to say, going to such a festival will require a lot of preparation to do it right. I did hours of research on the subject, visited events hosted by “Burners” to welcome newcomers and give advice on what to expect and how to act. The only thing you can buy there is coffee and ice, everything else is on a trade basis and gifting is another big thing there. Alcoholic drinks are given out for free pretty much around every corner and at each of the 50 plus music stages, just bring a bottle and fill up, they don’t expect anything in return and certainly don’t want your imaginary money. 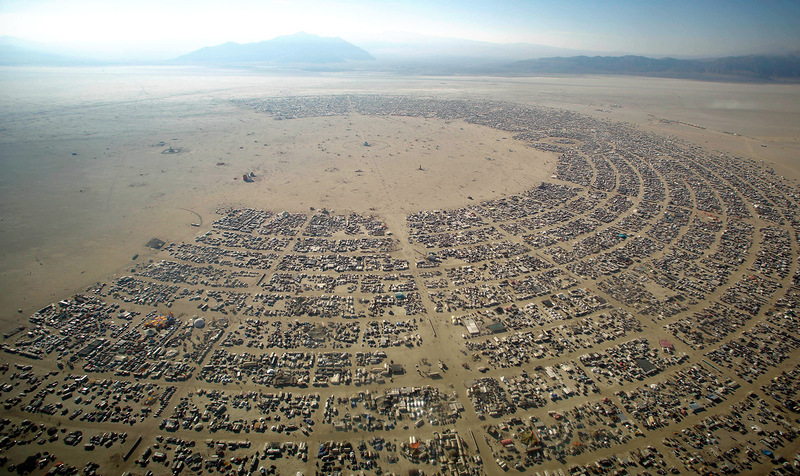 People get together to form giant camps. Often they might have a theme like barbaric Barbie Doll slaughtering, aliens, pirates, nudist hangout or roller skate disco just to name a few. This gigantic, temporary city is laid out with streets and addresses which are actually surprisingly easy to navigate, but if you get lost that’s actually a great thing. The view from above the city resembles a geometric pattern; a half circle with the Man in the middle and the temple further out. 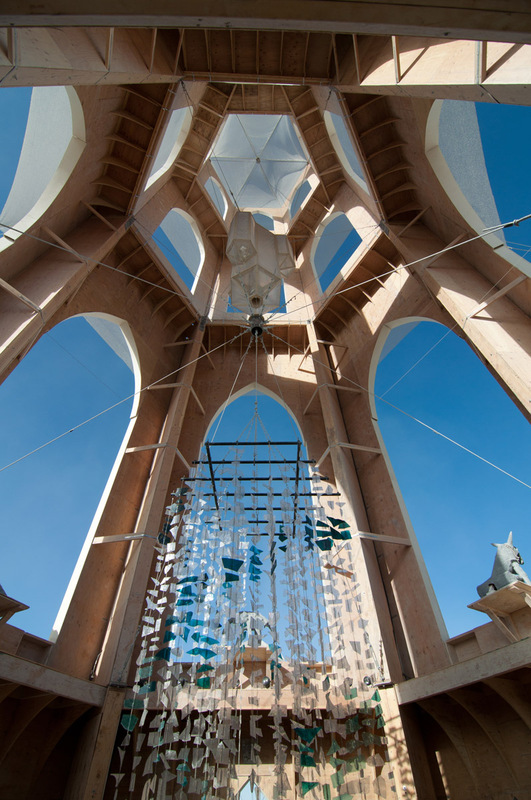 It’s a giant wood structure built every year. Both will be burnt in spectacular fashion at the end of the festival. You will want a bike, because on foot it will be very hard to see everything while you are there, which even then is near impossible. 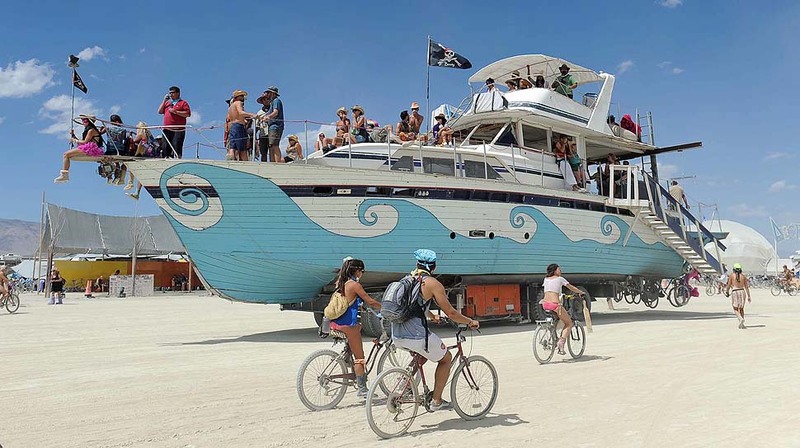 You can always hitch a ride with a gigantic party ship though, that drives through the Playa as a taxi service. You can hop on and off any time, or ride with any of the other hundred mutant vehicles available. The whole place is an alternative reality, a playground for adults looking to get away from the known society for a while, and they do a pretty damn good job at that. Each sound camp has a unique group of people who set up and bring in international performances for no real gain other than giving back to the community and improving the experience for everyone. 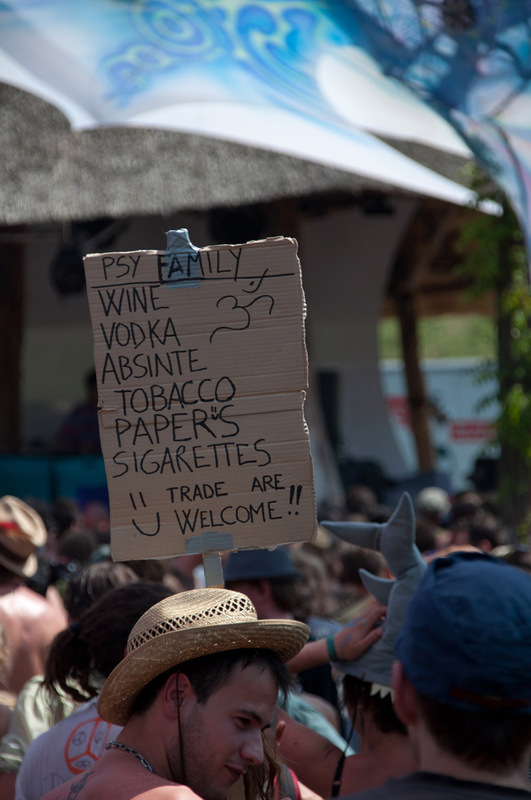 Often they will perform under fake names, so they don’t draw attention to their presence at the festival. 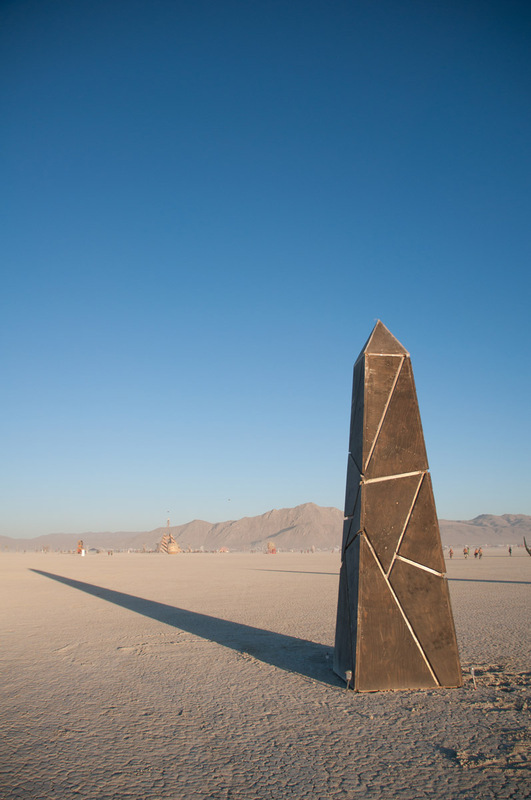 That’s something that really shines through this event, the independent people that go there and put lots of effort into giant structures, art projects, giant complex stages and cars driving through the desert spitting fire. They don’t do it for any financial or other gain, the only thing they get are smiles and lasting impressions in the people that get to experience it. I must admit, I went there as an observer and after it was over I actually felt guilty, that I didn’t provide anything for the community at large, an effect that first-timers often report. I haven’t returned there yet, because I know when I do, I want to be able to offer something in return. At the temple, visitors bring and express their emotional troubles, deaths in the family, deaths of friends or any baggage that they carry with them. Some bring cremated ashes or personal items from loved ones, and the burning of the structure then is a way of letting go of the past and moving on. For me, I also contributed a significant, personal offering, and it has helped me in many ways. 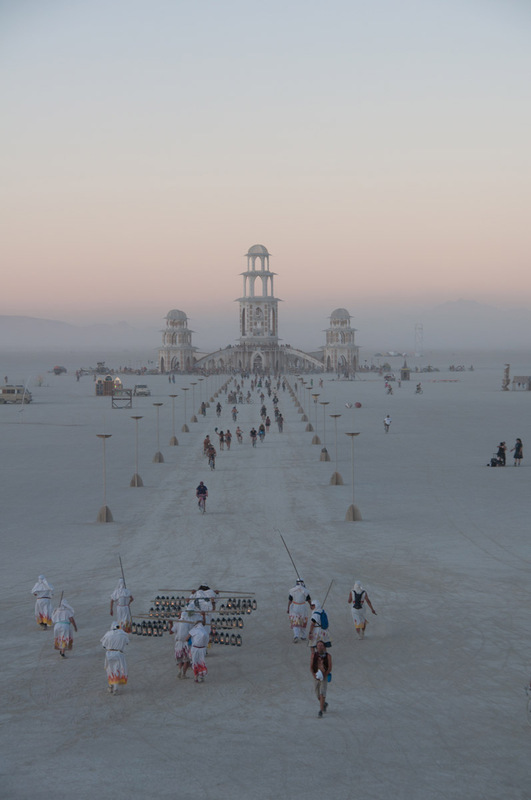 It’s mesmerizing, sitting in the crowd in front of the structure when it is set on fire, with its heat wave felt from a distance filling your whole body with warmth. Fire ignites something very primal in every person I believe, and watching something so beautifully planned and built just to be destroyed in the end, is amazing to see. 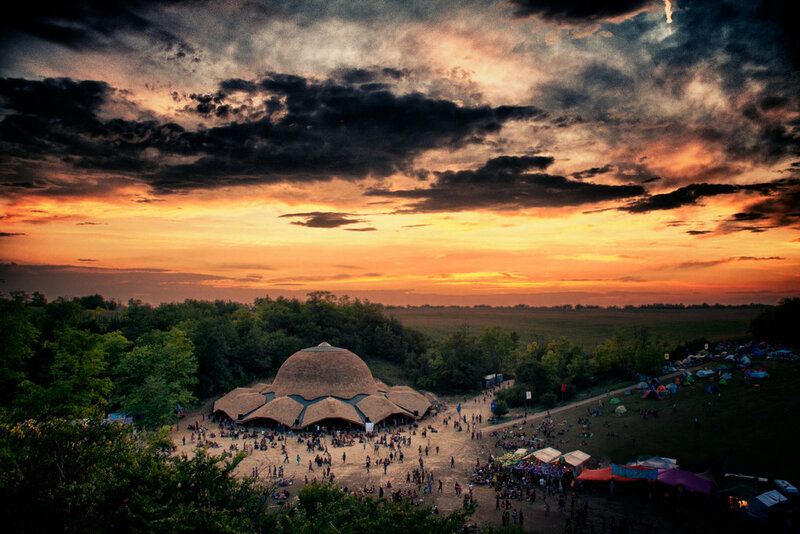 I think every person approaches this festival with their own unique view of what they want to experience. For me, I felt like it helped me get over a lot of fears and personal issues. I gained from it what I expected, although the whole event was a lot larger and more overwhelming than I had ever imagined. I couldn’t help but feel sad when I left and was stuck in a traffic jam that stretched for miles and miles. Obviously, I didn’t plan my departure in the best way. I listened to the radio show hosted by the festival and slowly exited the premises. As soon as my tires touched pavement I knew I was returning back to regular life. But inside of me, an inspirational experience that changed my life forever remained.